Wall Control Pegboard Tool Organizer System Units are easy to install and designed to be modular so you can grow your tool storage area as large as you want. Whether you start with just one unit or dozens, you can grow and expand your tool storage system with Wall Control's versatile, best-in-class Metal Pegboard System. 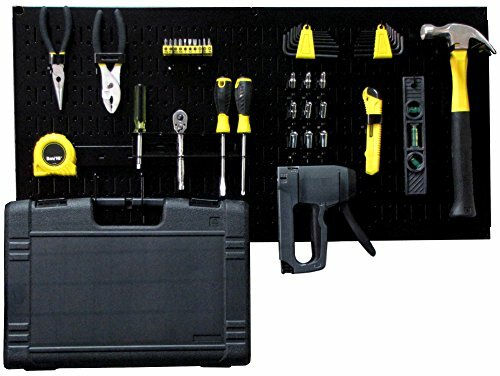 This Wall Control Pegboard Tool Organizer Unit includes Wall Control's popular Horizontal Metal Pegboard Panel and attractive, secure popular accessories. Wall Control Tool Organizer Units will work with the entire Wall Control product line so you can add additional Wall Control panels and accessories to make a tool storage space that is specific to your needs. This kit includes some of the most popular Wall Control accessories and will get your tool storage area started with great coverage whether you are buying a single unit or covering a large area with many units. The 16 inch tall x 32 inch wide powder-coated black metal pegboard is both attractive and strong for heavy duty storage and organization due to the all-metal construction which makes it over 10 times stronger than conventional pegboard creating an industrial grade tool storage solution that will last a lifetime. Wall Control Metal Pegboard offers both slots and holes to accept slotted tool board accessories as well as conventional 1/4 in. pegboard hooks making this pegboard extremely versatile. The patented engagement of the slotted tool board hooks included improves hook security for hassle free tool storage. These versatile, durable and high strength metal pegboard panels are an easy-to-use tool storage solution in any application. The pegboard panels are easy to install into studs or flat surfaces with pre-drilled mounting holes. A built-in frame return flange provides ample hook clearance and full access to all holes without requiring additional framework or using up pegboard holes for mounting. Wall Control Pegboard Unit includes mounting hardware and is Made in the USA. MODULAR PEGBOARD ORGANIZER SYSTEM: The Wall Control Metal Pegboard Tool Organizer System is Modular, meaning you can grow and expand your system as your tool storage needs change by tiling multiple pegboard panels. Buy one unit or many units and grow your tool storage space as needed. This Black Pegboard Unit works with all Wall Control Pegboard and Accessories so you can easily match and grow your tool storage system as needed. MOST VERSATILE TOOL PEGBOARD SYSTEM: Wall Control Pegboard Panels accept conventional 1/4 inch pegboard pegs as well as Wall Control's patented slotted pegboard hooks, brackets, shelves, and supplies for maximum tool storage versatility and options. Wall Control Metal Pegboard Panels also accept Magnets so you can use Magnetic Tool Holders, organizers and accessories on this pegboard tool organization system. STRONG METAL PEGBOARD: Wall Control Pegboard is over 10 times stronger than conventional pegboard due to its metal construction. More strength and durability equals more storage. Wall Control Metal Pegboard can hold heavier weight loads and last longer than plastic or pressboard pegboard which are both made of weaker, less durable materials. Wall Control Metal Pegboard is attractive, strong, and engineered to last a lifetime thanks to its metal construction and durable powder-coated finish. EASY TO INSTALL PEGBOARD: Wall Control Metal Pegboard Tool Organizer Units are easy to install and include mounting hardware for wooden studs as well as drywall. Wall Control Metal Pegboard Tool Boards are constructed with preformed return mounting flanges that mount flush with the wall or stud and do not require additional framework to space the panel face off of the wall for hook pass-through clearance which makes pegboard installation easy. PEGBOARD UNIT INCLUDES: (1) Wall Control 16-Inch Tall x 32-Inch Wide Horizontal Black Pegboard Panel (12) Wall Control Standard Hooks, (4) Wall Control Medium Hooks, (4) Wall Control U-Hooks, (3) Wall Control 1x1 C-Brackets, (2) Wall Control 2x2 C-Brackets, (1) Wall Control Screw Driver Holder and Accessory Holder, (1) Wall Control Hammer Handle Holder. Black Pegboard with Black Accessories. Mounting Hardware IS Included. Tools and Tool Sets are NOT Included. Made In USA.